As the global thirst for Satellite Communications (SATCOM) bandwidth increases, the need to actively manage SATCOM Network Operations (NetOps) to ensure Quality of Service (QoS) becomes increasingly important. is not only prohibitive, often placing it beyond the means of many organizations, but outside their scope and capabilities. The former acquired UK-based Parallel Limited, the developer of the award-winning SatManage network management software suite.Through a cash transaction, iDirect purchased 100 percent of Parallels equity shares as well as full ownership of SatManage. Parallels chief technology officer and entire development team will join iDirects engineering group. The annual Consumer Electronics Show (CES) in Las Vegas is always something of a technology show-stopper, with the latest gadgets and gizmos seeking  and usually finding  popular headlines amongst newspapers and web-forums. But few could doubt the impact that last weeks CES had, and will have as this broadcasting year unfolds. All of the content industry is currently talking about the arrival of 3DTV. However, three-dimensional video is nothing new. Satellite pay-TV has proven to be a strong business for satellite operators in recent years Distribution of satellite pay-TV channels (which account for around 60 percent of all satellite channels) is the leading revenue driver for satellite operators involved in video broadcasting. In fact, for those operators, satellite pay-TV represents more than 40 percent of total satellite capacity demand. The chaos that inevitably ensues during a natural or manmade disaster must be balanced with innovative technology for any chance at a successful recovery effort. As a watchful public eye can be quick to judge the effectiveness of rescue missions, it is essential to equip search and rescue teams with tools that can increase their intelligence to save lives in a situation where every second counts. Capturing live video in the field from mobile platforms is becoming increasingly valuable to Military, Homeland Security, and Public Safety. Traditional and new IP-capable networks (satellites, wireless 3G/4G networks, fiber networks, and the terrestrial Internet) offer opportunities to build Broadband Tunnels on-the-fly for coverage of critical events anywhere globally. Orbital Sciences is applying its experience in highly reliable and cost-effective systems to meet growing demand for GEO communications satellites with its new mid-size satellite platform, STAR 2.7. Alan Young isn�t looking through rose colored glasses. And you won�t catch him wearing a pair of the old red and green ones either. 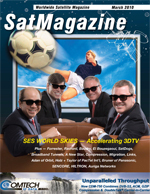 The CTO at SES WORLD SKIES is determined to help the industry do 3DTV right. The satellite broadcast market today predominantly uses MPEG-2 compression to encode, transport and decode programming. However, the industry is fully engaged in a transitional period. Migration to the more efficient MPEG-4/H.264 compression scheme has become a reality, particularly at the contribution level. As broadcasters expand their reaches into new markets, explore new areas for brand extension, and seek new places for revenue generation, they require a partner to help them move forward. The future is bright for broadcasters who base their international expansion activities upon a well placed, well equipped, and well connected global transmission player. Mr. Israel Adan joined Orbit in April 2009, bringing with him more than 25 years of global telecommunications experience. Prior to joining Orbit, Mr. Adan served as President and CEO of Orbit/FR, Inc., a U.S. public company and producer of sophisticated, automated microwave test and measurement systems for the aerospace, defense, wireless communication, automotive and satellite industries. Prior to joining Orbit/FR, Mr. Adan co-founded and served as a Senior Vice President, Business Development, at SigmaOne Communications Corp., where he was responsible for the worldwide development of wireless location technologies and services. Mr. Adan also served as President of Tadiran Inc. (USA), a public (NYSE) US$1 billion telecommunications equipment and systems company. In addition, Mr. Adan served as Chairman and Director of several Tadiran USA subsidiaries. Previously, he held the rank of Lt. Colonel in the Israeli Signal Corps and was Head of R&D in the fields of advanced telecommunications and signal processing. Executive Spotlight  Steffen Holzt + Andrew Taylor, Founders + Principals Pactel International Pty Ltd.
Steffen was born in Hamburg, Germany, where he attended a technology University and has completed two years of banking and international trade training. He then spent the next 17 years working in PNG and New Caledonia in the satellite industry. In 2003, when Pactel International was formed, Steffen has moved to Sydney. Steffen believes Sydney is just the right place for business, focused on the Pacific Islands. Andrew was born in Hobart, Tasmania, where he has completed a degree in Engineering. Andrew came to Sydney for a holiday 19 years ago and stayed there ever since. He then worked in various commercial and engineering roles at PanAmSat, Comsyst, Optus, and Telstra. In 2003, together with Steffen Holzt, Andrew co-founded Pactel International. As Vice President of Global Communications Services for Panasonic Avionics Corporation, David is responsible for marketing, business, network and fleet operation of the global communications suite of products and services, which includes broadband, television and mobile phone services. Prior to joining Panasonic, David was the Director of Business Development for General Dynamics Airborne Electronic Systems (now known as Astronics). Previously, David was President of Inflightonline  a web media company focused on the in-flight market and Senior Vice President of AT&T Aviation. In total, David has more than 22 years in the aerospace industry, including five years at American Airlines SABRE group. Panasonic Avionics Corporation has developed a next-generation solution for in-flight broadband connectivity  Panasonic eXConnect. The offering, which relies on satellite technology from iDirect, is being embraced by major airlines worldwide. We spoke to Panasonics David Bruner to find out how airlines and their passengers are benefitting from the new service and what Panasonic has in store for the future. The SENCORE Atlas professional multi-format modular receiver decoder (MRD) is installed by more broadcast, cable, satellite, and telco providers than any other. The Atlas MRD combines dual-channel processing capability with MPEG-2, MPEG-4, 4:2:0, 4:2:2, SD, and HD video decoding, resulting in reliable support for a wide variety of contribution, distribution, or backhaul environments. A recent addition to the Hiltron product range is the HMAM, a complete high-precision rotatable satellite antenna mount for use in commercial satellite operations. In the desire to reduce their capital overheads, some satcom service-providers have tried using consumer mount devices for VSAT and for downlinks, only to find that the solutions they have chosen are unreliable. The Hiltron HMAM combines affordability with the reliability and precision expected of professional-grade communications equipment. Auriga Networks has been formed by a group of Industry leading VSAT professionals (originally under the name DC-Sat.Net) and has grown to become a leading global provider of VSAT services, building reputation across the European market by bringing broadcasters the most affordable remote video contribution services.